The train from Hexham to Newcastle was packed full of commuters and Christmas shoppers. I met Anne-Marie Trevelyan and others for lunch in Newcastle and there was much talk as to whether Brown will have an early election. We all agreed that with Mandelson now pulling the strings in Downing Street anything can happen. Brown’s famous sense of risk avoidance in matters political may be overruled by Mandelson. If Brown calls it on the earliest proposed date of February 26th 2009 then we will be ready for the fight. If it is not the spring then it will be either June 4th [when the European and local elections are held nationwide], at some date in the Autumn or May 2010. All agreed that Brown was displaying classic signs of the bunker mentality - involving a reluctance to admit anything he has ever done was wrong and an increased detachment from reality. I am torn between my desire for Brown to continue to do such a terrible job - thereby increasing the electorate's desire to get rid of him - and my genuine fear that he is doing untold harm to the economy and our long term prospects as a nation. You talk to businessmen and all agree things are going to get a lot worse in 2009 and that the cut in VAT has helped not a jot. I know from our family business that lending is the key: without bank lending being guaranteed we will struggle even more - on this issue Cameron has got it right for sure. After a meeting with Sir Neville Trotter, former MP for Tynemouth, at his home in Newcastle, I headed back to Hexham where Peter Atkinson, MP, and I had one of our regular meetings. 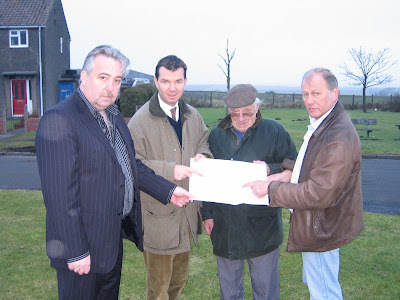 In the afternoon I dashed off to Halton Lea Gate, to meet Stan Rowntree, vice chairman of the Hartleyburn parish council, and Ian Hutchinson, the Haltwhistle County Councillor, to discuss the opposition to the open-cast mine [see earlier post of the meeting Halton Lea Gate in November]. It seems to have very few environmental benefits and a multitude of drawbacks. Nick Kennan, chairman of the North Pennine Protection Group, was also there: he was very helpful in explaining the environmental problems it will bring. Nick is passionate about what he does and knows his stuff. This may not be a big story elsewhere but it is in Halton Lea Gate: and the struggle here is a microcosm of the environmental debate that is going on in England today. There is no doubt we need to address alternative energy supplies, as oil and gas decine and climate change affects us more and more. But are we right to be digging literally within 100 metres of peoples back gardens and blighting the landscape that we are trying to promote as a tourist and environemental attraction for such poor reward? I know that you cannot visit this village and then see the damage that will be done to these peoples homes and way of life without feeling that this is not the right way forward. I went to the service at Hexham Abbey this morning. I arrived a little late to see about 25 children gambolling across the lawn, like spring lambs at play, on their way to make their Christingle candles. The church was packed and there was an interesting sermon from Audrey Elkington comparing the National Lottery to life – much use of the phrase “it could be you” and what it meant to all of us. Shortly before the end of the service, in came all the children to the front of the church, where they lit their candles. At this Canon Graham Usher warned “and this is the part where the fire officer has given me strict instructions!” A collective intake of breath from all of the adults followed, but the lighting ceremony passed off without incident, and the children held their candles while we sang the last carol. You could not fail to be moved: a genuine sense of Christmas washed over everyone. It was great to see all the families in church. Afterwards many stayed on for coffee and I got a chance to learn more about the Hexham Abbey visitor centre project from one of the Treasurers. The young came for the visiting reindeer. The rest of us were on the lookout for Christmas bargains. The Hexham Courant must be the only newspaper to give its readers mulled wine before Christmas, but the day was freezing and we were most grateful to the paper. The chairman of the local Conservative Association, Bev Nelson, invited all the Conservative councillors in the area and everyone who was involved in the candidate selection process. The group was a collection of councillors from all over, including Bellingham, Ponteland, Allendale and Hexham town itself, with a great turnout and a good atmosphere. There is a real sense of the way forward within this group, and a determination to make the best of a bad lot - namely the demise of Tynedale Council and the birth of the new unitary council – with all its problems. Afterwards Angus Nelson cooked supper for Karen and I, Bev, and Allan Deane, the local area agent and his partner Jules. Both Jules and Karen and were putting in impassioned pleas for a dog for Christmas, but these were firmly vetoed by Allan and I. A very solemn and sad day, as my family gathered for the cremation and memorial service for my wonderful grandfather. All the family were there, from great aunts to grandchildren, and my dad read a wonderful memorial tribute. Myself and my brothers, Pete and David, and my first cousins Mark and Nick all gave readings. It's amazing to think that he fought in the Second World War, built up a business through the great Depression, was old enough to remember coming to London at the end of the First World War and lived to the ripe old age of 102. We held a wake for him, Irish-style, afterwards, and gave him a grand send off. I spent the day at the North East Economic Forum, which was a great event and brilliantly organised. There is a real sense of energy and a desire to overcome the recession here, that seems a little missing elsewhere – or is it just that the North East is more resilient? There were a host of speakers – among them high-ranking politicians such as Peter Mandelson, Vince Cable and George Osborne, who all speak well in their own way. Cable as the avuncular uncle, Osborne all industry and effort and Machievellian Mandelson by video link from Downing Street. Mandelson was very much the smiling assassin loving being back in the limelight. Of the other speakers Margaret Fay impressed in particular. She represents One North East, an organisation which does sterling work in difficult times. - Transport: the impossibility of the A1 being improved until it becomes part of the national plan was made abundantly clear. There is a tiny budget for regional road improvement and the A1 duelling will cost more than the annual budget for all the roads in the North East. It is a government decision pure and simple. Anne-Marie Trevelyan (our prospective candidate for Berwick on Tweed) is doing a great job with her “Dual the A1 Campaign”, but Geoff Hoon, Minister for Transport, is the man to decide this issue. And he pointedly ducked the question when it was put to him the night before. The safety, business, and economic case for improving the A1 is beyond dispute: it would also have a good side-effect in that it would bring trade and closer links between South Eastern Scotland and the North East. - Tourism: Very interesting talks about Hadrian’s Wall, and the need for a tourism conference to try and bring all the different tourism organisations together. It’s a great shame that Hexham and rural Northumberland have such low revenue from tourism compared to other parts of the country – like coastal Northumberland or Cumbria – both of which have double our tourist revenue. - Climate change / Environment: an interesting discussion and debate on wind farms. The offshore case for them is strong on a multitude of levels, but the inshore case is clearly flawed, particularly in an area like Northumberland / Hexham. - Also had a good chat with the Journal journalists and the local man from Sky News. It was the North East Economic Forum Dinner in Gosforth Park. It was an interesting evening notable for the number of key businessmen and women from the region all in the same place. It was also a good opportunity to meet the Federation of Small Business and key Chamber of Commerce representatives. Geoff Hoon gave the keynote speech. I know I’m partisan, but it seemed he didn’t answer a single question with a straight answer – ie with a simple yes or no – and I felt this style of evasion upset the room. He was all at sea on the quaestion about the A1. Hoon is known as Buffhoon by Private Eye which is harsh but fair. They say Transport is a brief held by either those on the up or those on the gradual slide down - it is sadly clear the way he is heading. Wendy Morton (prospective parliamentary candidate for Tynemouth) and I approached Adam Boulton, political editor of Sky News, over dinner and persuaded him to return and cover the general election in the North East. There are a number of great local stories here – and the political scene is changing dramatically. I believe Wendy is brilliant and will win in Tynemouth, where Labour’s Alan Campbell is clearly toast. The technique of approaching someone who does not necessarily want to talk to you is called "doorstepping" - after the way in which journalists have to literally stand outside the unfortunate's home to get a quote. I am not sure Adam Boulton was expecting us when he was trying to eat his dinner but he needed to know and agreed to return with good grace!